Since 1935 Peoples Professional Cleaners has operated under the philosophy that providing quality work and impeccable customer service has its own rewards. We are a family owned business with a proud reputation for taking full responsibility for the work we do. Most of our staff has been with us 10-15 years, and take pride in who we are and the service we offer. We do all our own cleaning. Many dry cleaners send out their work. Some even ship their work to us. 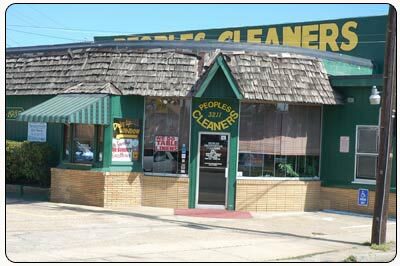 Peoples has the facilities and the expertise to do our own cleaning safely and efficiently. We offer cleaning services using the latest state-of-the-art equipment and processes available. We use environmentally friendly products and processes wherever possible, and take great care in providing a great value to those depending on us for their cleaning needs. The Bottom Line: Peoples offers the cleaning services our customers need and the customer service they deserve. 1935: B.G. James opens “Peoples Cleaners” at 3211 Chesapeake Blvd, building a 40 year reputation for quality work, treating clothing extremely well and caring for each piece by hand. 1974: Harold Schantz purchases Peoples and begins building upon the family-owned tradition with more state of the art equipment and solvents. 1980: Peoples adds fire/water/smoke damage restoration services. 1989: After over a decade of service at Peoples, Sheldon Schantz purchases the store from his parents. 1997: Built new location at Greenbrier in Chesapeake. 2007: Picked up Bayside Cleaners, another neighborhood favorite with a great reputation for taking care of customers and their clothing.